I realize Feedback & references are very important for any business for its long term success. Customers can leave there feedback on this page for all to see. Also this page is dedicated to Reviews, Redhot-Roadrelics.com . Also I have sold 1000’s of OLD ANTIQUE SIGNS & VINTAGE NEON ADVERTISING CLOCKS in the last 30+ years with 99% success rate. Furthermore if there is a problem I will address it immediately and resolve the issues guaranteed. All my signs for sale are guaranteed 100% original or we will issue or a full refund minus shipping costs. I recommend this company 100%. My wife loves the paint signs I bought from you…very pleased!!!! Bought several signs for my garage and they look great after installed. Hope to do business with you again. Thanks for the great sign ! A great person to deal with…. Darryl will treat you fair and you will get what you pay for. 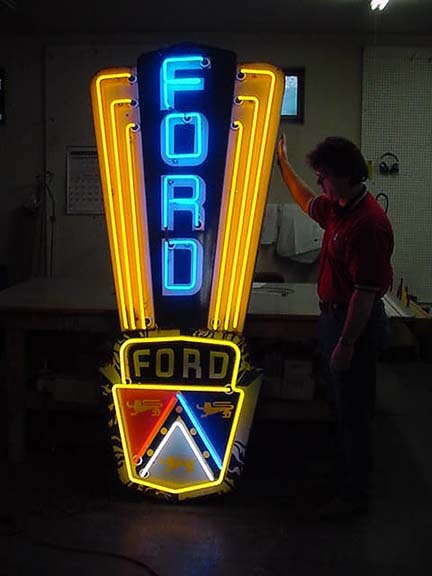 There are so many people selling reproduction, fantasy and fake signs as originals, however you will not get those types of signs at ROADRELICS, only good old originals…..
We sold several signs to roadrelics and he was great to deal with !!! One of he best in the business. Bought a great Chevrolet sign at a great price !!!! Great addition to my signs collection..Thanks !!!!! The signs actually came yesterday already. That 7 up is really clean. I like them all. Thanks again Darryl ! I have known Darryl over 20 years and have done many sign deals with him, its always fun and an adventure to be around. My wife and i bought a sign on ebay from roadrelics and the deal went perfect. We love our new sign.Thanks for your hospitality. Darryl,The signs arrived today without damage. My wife loves the signs and really likes the vivid colors on the Pittsburg Paint sign.Porcelain Signs And yes indeed both signs are in excellent condition. Thanks!– Bruce PS….My wife loves the paint signs I bought from you…very pleased!!!! Got a great small soda sign for our kitchen and it looks exactly as described. We will be back for more.